Prime Series Hospital Bed Including Therapeutic Pressure Relief Mattress. It is designed for the patient looking for comfort and pressure relief in a long term care environment. This package includes the prime care hospital bed and the therapeutic pressure relief mattress. This Prime Long Term Care Hospital Bed package includes everything you need for patient comfort, pressure relief and bedsore prevention. The prime care 301 series hospital bed is a premium long term care bed with all of the cores features needed in a hospital bed. 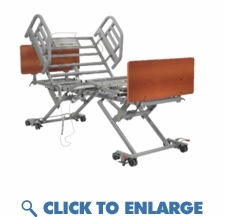 This hospital bed is packed with features and is much better than a standard traditional hospital bed frame. This model supports 450 lbs and includes four heavy duty locking swivel casters. The pressure relief mattress includes 3 layers of therapeutic foam including a true memory foam heel section to optimize pressure redistribution. Everything is included in this package to make it an easy choice for long term care therapy. This is the #1 choice for patients who replace the standard inner spring mattresses that come with a traditional hospital bed frame. Long Term Care Hospital Bed With True Low Air Loss Mattress Package 42"